The Shuber Vise is a card guard that has a card press integrated. I always wanted to combine these two functions into one small enough accessory to fit into my pocket. The Shuber Vise does exactly that. It is not wider than a deck of cards and is only somewhat longer and thicker, yet it perfectly protects your cards and keeps them under pressure so that they do not warp or bend, which every deck of cards does after some use without being pressed flat. With decks that cost $20 and more these days, it pays to take good care of your cards. The Shuber Vise is designed by an engineer and made for card workers. Its frame is made out of black anodized aluminum, and the counter plate is made out of stainless steel. 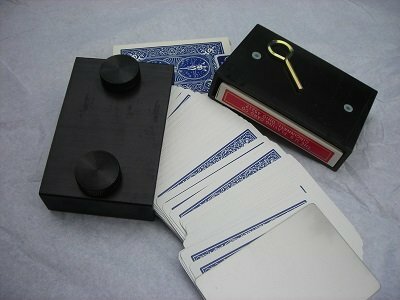 You can load a cased deck or a deck of cards without case into the Shuber Vise . You receive two tightening solutions. One is a set of two metal setscrews with a hex-key. The other is a set of two thumbscrews, which are tightened and loosened with your bare fingers. I love how the Shuber Vise handles. It provides a nice heft, but is not overly heavy given the amount of pressure it can impart on a deck of cards. Empty weight, meaning without a deck of cards, is less than 7 oz (185 grams). If you want a modern conversation piece, something nobody else has, a combination of functions not available in any other card guard or card press, then this is for you. Once a deck is loaded and locked in the press it can only be removed with the hex-key, unless you are using the thumbscrews. If you carry the hex-key separate from the vise, for example on your key-chain, or in your pocket or wallet, your cards are protected from curious hands. Nobody will be able to remove the deck, because people typically do not run around with hex-keys. My goal was to achieve an industrial look. That means the aluminum is not polished. It has been left raw, including scratches, nicks and other abrasion marks, saw marks, some slight color changes here or there, etc. It has been anodized to achieve a black color and protect the surface. This is a tool, an accessory, you should not be afraid to drop or step on. It will last you a lifetime and then some. After purchase you will be able to download a PDF that will tell you a bit more about use and care, and alternatives to store the hex-key.